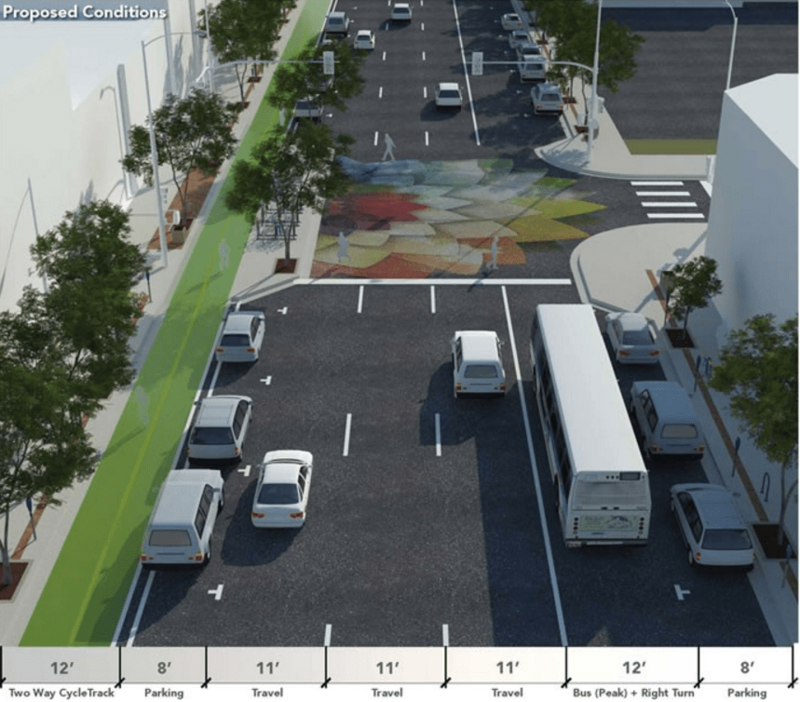 Denver Public Works and its transportation consultant Fox Tuttle Hernandez presented their recommended redesigns of Broadway and Lincoln streets Thursday night at the second community workshop for the project. 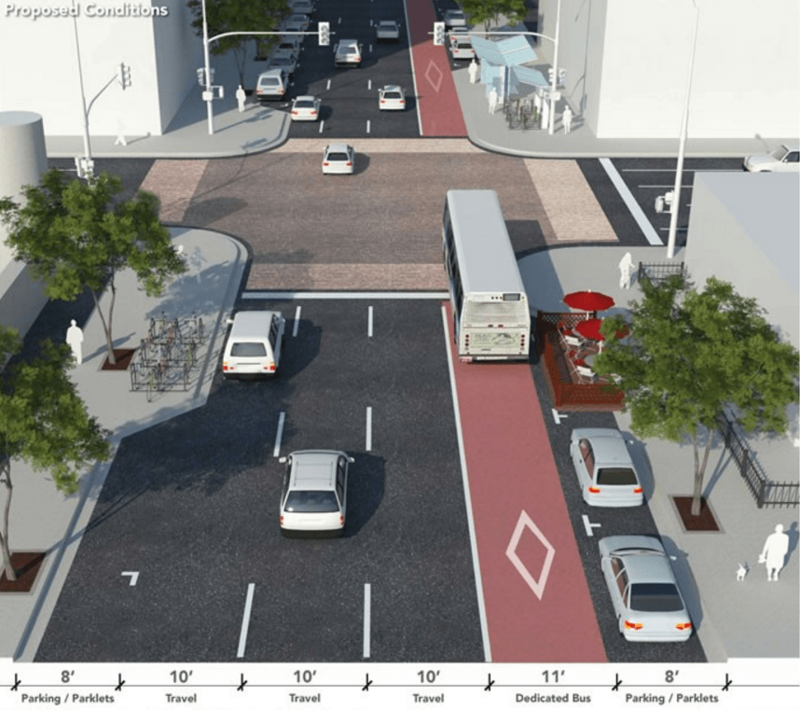 Planners aim to install a two-way protected bike lane along Broadway between Colfax and I-25, but they have yet to decide if they will implement it on the entire 2-mile section. The plan also includes a better bus lane on Lincoln that will improve transit while calming traffic. The top graphic shows how Broadway from Speer Boulevard south would look with the redesign. Bulb-outs at corners would make shorter crossings for people walking, and the bus-only lane would remain during rush hour. Those 11-foot travel lanes are too wide, though. The extra space should go toward a bigger buffer between the bike lane and parked cars to prevent cyclists from getting doored. Broadway and Lincoln aren’t designed to move people safely. They’re designed to move cars fast. Carlos Hernandez, who’s heading the consultant team, told the crowd last night that will have to change as more people continue to move to Denver. Even during rush hour, traffic on Broadway and Lincoln can move at dangerously high speeds, and the problem only gets worse when traffic thins out during the other 22 hours of the day. It’s a perpetual hazard for people crossing the street, and people on bikes have to take their life in their hands riding next to traffic moving at 45 mph or opt for the perceived safety of the sidewalk. South of Virginia Avenue, Lincoln would have skinnier lanes to calm traffic and more prominent markings to set off the bus lane. Since traffic on Lincoln tails off during off-peak hours, both outer lanes — including the bus lane — would become parking lanes for most of the day. Right turns from the transit lane are currently allowed; Hernandez said some could be banned on blocks with light turning volumes (those blocks have yet to be identified). From Virginia to 5th, Lincoln would still have three general purpose lanes for most of the day, but they would be narrower. The west sidewalk would unfortunately get smaller to make room for a row of parking, but planners say that will calm traffic and make homeowners and merchants happy. As with all of the intersections on the corridor, new paint or pavement would make intersections more noticeable and draw attention to pedestrians. Parking would be allowed in the bus lane except during rush hours. The northern part of Lincoln would have a much more clearly designated bus lane that’s in effect 24 hours a day. 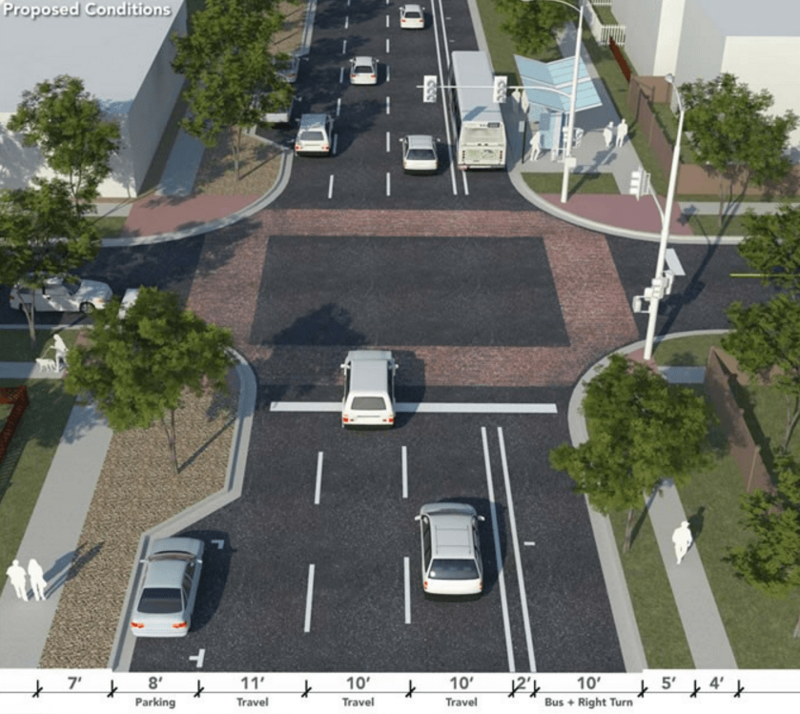 The redesign would also add curb extensions to make crossings shorter for pedestrians. The next phase of the project starts in March, when planners will host more public meetings and reveal more detailed design plans based on feedback. They’ll continue to analyze traffic patterns and begin planning a temporary version of the bike lane to demonstrate how it will work. This article was edited to reflect the fact that bulb-outs are not a major component of the project. I’m so excited to hear about this! Great job everyone involved. I’m a bike commuter so this will really benefit me but the more I’m around curb extensions the more useful I think they are. They’re amazing for pedestrians both in terms of shortening their crosswalk distance and making them more visible to cars and giving them better vision of traffic but they also help slow down traffic and take some of the guess work out of parking. They should really be added just about everywhere. Holy cow someone has been reading some European city planning manuals. I still don’t get those skinny green stripes between the sidewalk and street. They should cobblestone it. Another thing — they should put bollards at the crosswalks. Also the traffic lights should be on the same side of the intersection as the stopped traffic to keep cars out of the intersection. Still, this is a vast improvement over your average American city street. I’m very excited and I think its important we compromise, which I believe this is. Compromise is important to getting things done, as opposed to having them sit on drawing boards for their entire life. I agree, it’s frutrating that a bike lane that will do little to decrease car traffic gets more press than the transit lane that could have a significant impact on decreasing car traffic going into downtown because it would serve a larger service area and would tie in with the light rail system. The removal of the dedicated transit lane on Broadway is of far greater impact to our multi-modal streets. Sad that complete streets so often gets the shaft on this blog in favor of cycling. 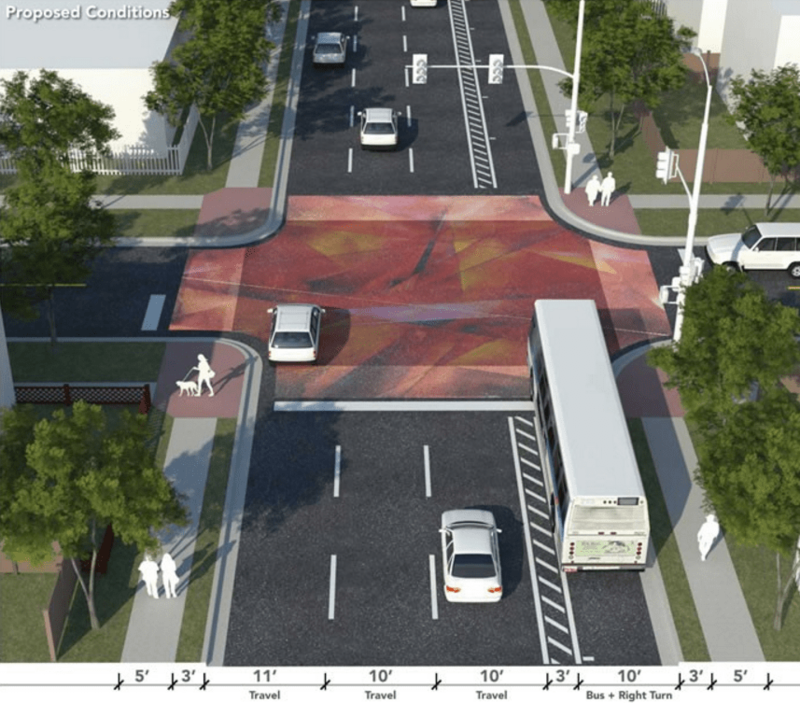 Triangle Neighborhood Plan, however, envisioned a 24-hour bus-only lane. RTD will have to get more involved. Also, please check out our coverage of East Colfax “BRT” if you’re interested in the transit aspect of complete streets. Thanks for reading! Well, the city and the consultant are not exactly correct. I just looked, again, at the presentation from the first workshop and all alternatives for Broadway show a “Transit Lane” marked in red. Lincoln, on the other hand shows an uncolored “Managed Lane (AM Transit).” Now it did not say “Transit Lane Only”, but since it is starkly different from the “Existing Conditions” diagrams, the implication was there. Besides, if Lincoln can be reduced to two travel lanes in some places, surely Broadway can be reduced to three lanes during off peak periods. I have confirmed with both the city and the consultant that none of the previous alternatives included a true bus-only lane. All of them included a transit “flex” lane, so nothing changed there. The Golden Triangle Neighborhood Plan, however, envisioned a 24-hour bus-only lane. For the record, it would be great to see a true bus rapid transit lane on Broadway and Lincoln. This plan is not set in stone. I think it’s possible, given Denver’s undertaking of the citywide transit plan, but RTD will have to get more involved. As for high speeds, I mentioned in the post that the lanes are too wide. It should be a transit only lane on Broadway as well. General traffic does not need to drive down that lane. I’m going to agree that a transit lane should be a transit lane – there’s no reason to give it bavk when there’s less car traffic.. Also, I agree that the lanes on Broadway are too wide. They should take a foot from each and give it over to the cycle track. As a long time resident on Lincoln Street I have some confusion regarding the parking plans on the west side. I understood from the presentation that the parking would be in the traffic lane in non-peak hours. This would leave 2 lanes of traffic with the east lane and the west lane for resident and people visiting Broadway parking. Above it states ” The west sidewalk would unfortunately get smaller (narrower) to make room for a row of parking, but planners say that will calm traffic and make homeowners and merchants happy.” The photo shows bulb-outs which would make this lane parking only and not a traffic lane…unless these 4 wheelers can run over the bulb-outs! Cutting into our tree lawn (right-of-way) and making our sidewalk “narrower” is not ped friendly. The place-making characteristics of Lincoln is the historic houses, 100-year old trees and our historic 120 year old 3 inch thick sandstone sidewalks. The residents do not need parking at the expense of our trees and green space. The merchants do need parking and they would be the only ones who benefit from this plan. Most of us have parking behind our houses and parking on Lincoln would be nice, but not at the price of loosing what makes Lincoln St special. I realize that this is only a ‘plan’ and not written in stone.